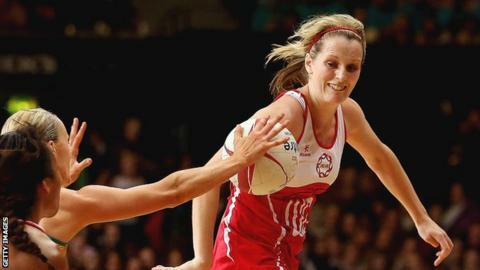 Manchester Thunder's Sara Bayman could miss England's upcoming Test series against Jamaica with a knee injury. Bayman, who was involved in in January, was hurt while playing for the Superleague winners in their defeat by Team Bath on Sunday. She required a minor operation on the knee she had reconstructed in 2011. "Unfortunately my knee liked losing even less than I did. I'll be missing the next few games," said Bayman. "I have no doubts the girls will barely miss me though, apart from my colourful team talks." Tracey Neville's Thunder, who for the first time last year, started the 2013 campaign with a victory at Yorkshire Jets before suffering a first loss of the season to Team Bath.